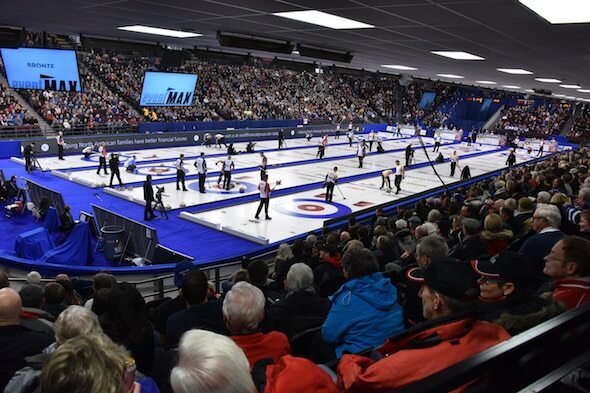 Organizations who wish to host a Curling Canada event must make their intentions known by writing a letter, specifying the event and year, to Danny Lamoureux at Curling Canada’s national office. For the Canadian Mixed, Club Championships, Canadian Seniors, Canadian Juniors, University Championships, College Championships, Mixed Doubles, Under-18 or the Canadian Wheelchair events, the follow-up will be done by Danny Lamoureux, Director, Championship Services and Curling Club Development. 6,000 (minimum) seat arena with associated facilities: One (1) facility in the 60,000 – 80,000 sq.ft. range. Curling Canada must be confident that the site selected can be financially successful and that there will be civic and provincial support of the event. 75 hours of live television coverage is included. 3,500 (minimum) – 5,000 (maximum) seat arena with an associated facility of approximately 30,000 sq.ft. Curling Canada must be confident that the site selected can be financially successful and that there will be civic and provincial support of the event. 75 hours of live television coverage is included. 2,500 (minimum) – 4,000 seat (maximum) arena with an associated facility of approximately 20,000 sq. ft. 28 hours of live television coverage is included. 6,000 (minimum) – 10,000 (maximum) seat arena with an associated facility of approximately 30,000 sq.ft. Banquet facilities required. 75 hours of live television coverage is included. 2,500 (minimum) – 4,000 (maximum) seat arena with an associated facility of approximately 20,000 sq. ft. Banquet facilities required. 75 hours of live television coverage is included. Tim Hortons Canadian Curling Trials (every four years, this event determines Canada’s male and female teams to the Winter Games) 75 hours of live television coverage is included. 6,000 – 10,000 seat arena with associated facilities as outlined for the Brier. Curling Canada will stream live. Banquet facilities to accommodate 400 – 500 people. Tim Hortons Brier, Scotties Tournament of Hearts, Roar of the Rings Canadian Curling Trials and the Ford World Championships: Curling Canada may accept bids for these four events up until 24 months prior to the start of the event. If we have not received a bid by that date that is deemed acceptable to host the said championship or are unable to negotiate the appropriate contracts with one of the bid sites considered to be acceptable we will then solicit interest from a site that we deem would be an appropriate host for the event. Canadian Juniors, Home Hardware Canada Cup, Canadian Mixed, Canadian Seniors, Canadian Wheelchair, World Financial Group Continental Cup, CIS/Curling Canada University Championships and any other event not listed above: Curling Canada may accept bids for these events up until 24 months prior to the start of the event. If we have not received a bid by that date that is deemed acceptable to host the said championship or are unable to negotiate the appropriate contracts with one of the bid sites considered to be acceptable, we will then solicit interest from a site that we deem would be an appropriate host for the event. 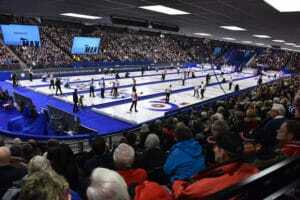 Tim Hortons Brier, Scotties Tournament of Hearts, Roar of the Rings Canadian Curling Trials and the Ford World Championships: The public announcement of the successful site for these four listed events will be made no later than 16 months prior to the start of the event. Canadian Juniors, Home Hardware Canada Cup, Canadian Mixed, Canadian Seniors, Canadian Wheelchair, World Financial Group Continental Cup, CIS/Curling Canada University Championships and any other event not listed above: The public announcement of the successful site will be made no later than 12 months prior to the start of the event. *** If for some reason the Curling Canada does not have a qualified site which it deems acceptable and appropriate to host an event, then it reserves the right to change the timelines for the bid process and/or the site selection and announcement.